The Trial of the Incredible Hulk (1989): This is the second of three made-for-TV movies based on the previously cancelled TV series of "The Incredible Hulk." I was never a fan of "The Incredible Hulk" TV series. It wasn't a good comics adaptation, but that's not what bothers me. As a matter of fact, some superhero shows are better if they aren't faithful adaptations. I actually found it too boring and uneventful. However, the television movies that they made long after the TV series was cancelled were very well-done and exciting! This TV movie is great because it brings in two other popular Marvel Comics' characters: the superhero Daredevil and his arch-nemesis Kingpin. 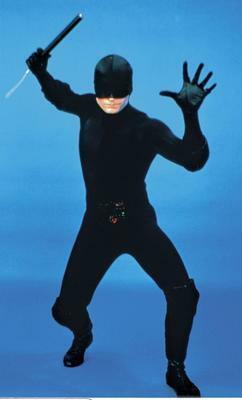 Rex Smith played the blind superhero Daredevil who by day was attorney Matt Murdock. 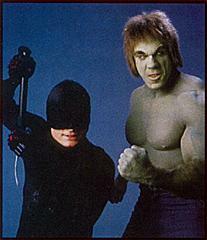 I like Rex Smith, and think he made a much better Daredevil than Ben Affleck. He had the attitude that you expect of someone named Daredevil and matches the personality of his comic book counterpart. The major difference is that Daredevil's costume is black in this show, instead of the classic red. I suppose it is more realistic that his costume would be black so he wouldn't be seen. Some people, I've heard, make a much bigger deal out of this detail than they should. The Kingpin is played by John-Rhys Davies. He does a good job as well and has the same serious, no-nonsense demeanor as the previously established comic book character. He doesn't look like the comic book character, but that isn't a real big deal either. This Kingpin is still husky, but he's not so massive as the comics version. He also has hair and a beard: the Kingpin is bald and clean-shaven in the comics! The sunglasses he wears is a nice, menacing touch. I like the fact that the Hulk was meeting up with other superheroes. It makes for more interesting adventures. By the end of this show, we're led to believe that Hulk and Daredevil will meet again someday. Of course it never happened in the TV movies. Maybe it would have had Bill Bixby lived and the series of TV movies continued. Overall, this is an intriguing superhero adventure packed with plenty of action, especially from Daredevil.